Skeets trespasses into the home of ex-football player Daniel Jon Carter looking through his trophies and memorabilia. Carter surprises him with a shotgun, yet is willing to share his history. As a player on the Manchester Spartans, Carter scored a 98-yard touchdown run at the cost of a broken leg and damaged knee, both injuries ending his career. Now he's the self-proclaimed "Fifth-best Term Life Salesman." Skeets points out he could've wound up a museum janitor like Booster Gold, who apparently is the descendant of Carter's. Because Carter is 95% genetically identical to the late Michael John Carter, he's the only one who can enter Rip Hunter's underground laboratory and allow Skeets to uncover the source of the paradoxes his historical index is plagued with. Skeets then offers Carter the chance of acquiring a bioengineered super-identity for him with Booster's DNA as the baseline in exchange for his help. When�Carter points out it's a gamble, Skeets says "Gambling runs in the�Carter blood." In deep space, Lobo has led the ship carrying Starfire, Animal Man, and Adam Strange to a�large refugee camp�on a floating asteroid. Lobo is greeted by a space dolphin who regards him as "Archbishop of the First Celestial Church of the Triple Fish-God." The crew enjoys a shower and bath for the first time in weeks, all the while questioning Lobo's sudden reform. Starfire points out that he revealed to her that the alien giant who had hunted them halfway across space is Devilance The Pursuer of the New Gods. The debate is interrupted by the space dolphin who invites them to the�vestibule at Lobo's request. As they make their way through the cluttered streets, Animal Man complains at how the innumerable scents are interfering with his animal senses, while Starfire surmises that these aliens are living in poverty and the�surrounding land masses could have been planets once. They are led into the Vestibule, where Lobo is listening to the grievances of an alien insect whose language he can't understand. The space dolphin translates that the insect's land called Broken Country has suffered environmental stability and therefore needs the "splendid eye", to which Lobo takes offense. But the dolphin counsels him and Lobo explains his reasons for his objection. Adam demands an explanation for this bizarre change, for which Lobo points out he had a "moment of illumination", which caused him to redeem himself by abandoning all of his pleasures: swearing, women, violence, and liquor, although he does offer it to the three heroes. As to where they are, Lobo points out the Guardians of the Universe called it Sector 3500, and that it was once a thriving collection of systems. Adam tries to barter Lobo for his help in getting back to Earth, but he turns the offer down. Still, he invites them to join he and "Fishy" in their pilgrimage to "the Three Golden Planets" if they feel they can endure the hard journey. Starfire accepts, then asks who put a bounty on their heads. Lobo reveals it's the same one who laid�siege to Sector 3500, but she's not the real threat. METROPOLIS - Weather Wizard is wreaking havoc at the nearest bank, which attracts the attention of Supernova, and then Wonder Girl. After easily apprehending the villain and saving the�drowning employees, they formally introduce themselves to each other, Cassie confessing she's been off the grid for a while. She is surprised that Supernova doesn't recognize her, he asks her to respect his "personal space" when she reaches for his mask and flies off. He tells her to take care, which she says under her breath "I will... Kon-El." Arizona - Skeets has brought Carter to the underground complex wearing Booster's mask. After decoding the door's mechanism again, Skeets instructs Carter to go down into the lab as his eyes and ears via the goggles. Observing the north wall, which has the picture of Booster and the inscribed "It's all his fault," Carter wonders who. Skeets has no answer, then says "He Knows" and disconnects from the mechanism. The doors slam shut. The alarm goes off and an internal vortex is created, threatening to pull Carter in. The ex-football star fights for his life�while Skeets works a panel that sets the vortex's destination 1000000 AD. Though Daniel reminds him of the deal, Skeets says he'll relive his moment over and over for eternity. As Daniel Jon Carter is pulled in, Skeets remarks he's served his purpose. "The Origin of Animal Man"
After hunter Buddy Baker is incinerated by a radioactive concussive force from an alien spacecraft, the extraterrestrial geneticists take their work one step further and reconstruct Baker's body with a series of "morphogenetic grafts." The grafts allow Baker to connect with an unseen web that links all animal life, granting him the ability to tap into those animals' abilities i.e. gorilla strength, a dolphin's grace, etc. As Animal Man, he has changed his lifestyle from hunter to compassionate defender of life. Main Story - 5: Finally something interesting involving the Booster story. I have to admit that when the last issue hinted at the prospect of a new Booster Gold taking over, I wasn't exactly overjoyed because it seemed to cheapen the death. However, with the twist thrown in at the end of this chapter, I'm intrigued. Why did Skeets double-cross Carter? And who knows what exactly? What could Michael have done in life that justifies this massive conspiracy surrounding him and the chrononaut Rip Hunter? The idea that Supernova was really Superboy in disguise seemed to come out of left field; there's been no evidence to suggest that this is�Conner Kent resurrected. I guess they threw that possibility in to demonstrate how Cassie's still hung up on Conner. Speaking of Cassie, last I checked she was still a member of that Kryptonian cult. How did she manage to snap out of it? Why didn't the writers cover that angle? Or is she still a member but just downplaying it? Lastly, Lobo: like Cassie, this is a surprise. For 52, we have a passive, non-violent, born-again whatever Lobo. We all know it won't last; the DC head guys would never let their favorite genocidal madman convert completely. Something's bound to happen. Just how much does he know about the bounty hunter on the three heroes' tail? All in all, the creative team has added another layer of mystery to some of these characters' motivations and personalities. Hopefully we'll have some answers to these questions in the coming issues. Art - 4: I have to be honest. Seeing Pat Olliffe - a Marvel Comics artist best known for his run on Spider-Girl - on a DC book was a nice change of pace, but�I don't know if he fits the tone of the story. His take on Lobo could've been better, and some of the art seemed a little cramped together, especially the space scenes. However, seeing the interplay between Wonder Girl and Supernova, that teen soap opera it seemed to echo, made me nostalgic for his work on "Untold Tales of Spider-Man." Nice change of pace, Pat, but it needs work. Can't wait to see your take on Clark Kent, though. Backup Story - 4: I can't really give an opinion of the content because I've never been into Animal Man. However, the premise seems interesting. Art - 3: The art's alright but it seems a little stiff and lacks in between the first and last shots of Baker in costume. This is not Bolland at his best. 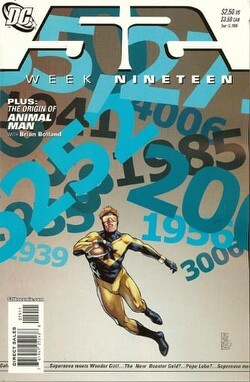 Cover Art - 4: The years surrounding Booster Gold and the hero carrying a football perfectly connects to both Michael Carter and Daniel Carter, since both seem to be on the same path though centuries apart. It also alludes to the prospect set in the previous issue that Skeets could find a new Booster Gold to pick up where Michael left off.